A few weeks ago, I got an email from someone in America saying that they were making a short documentary for a US airline to be used as part of their in-flight entertainment. The documentary was going to be about busyness and our inability to relax and switch off. They’d heard about the Boring Conference and wondered if I’d like to be involved. I said that I would, but explained that I lived in London and so wasn’t sure if I’d be able to take part. They said that wasn’t a problem and flew me to Washington. The idea was that they would team me up with a guy called Ryan who was extremely busy all the time. We’d spend the day together doing nothing and just talking about the smaller things in life. We watched some ducks in the park, we went for a drive, we counted how many pedestrians walked past us. I talked about Georges Perec and the infra-ordinary. It was fun and a bit weird. In the end, they only used about thirty seconds of it in the finished film. Like I say, I’m not in it for very long. A few weeks later, I got another email. The people who made the film were going to have a screening followed by a panel discussion in New York, hosted by Arianna Huffington. Did I want to be involved? Sure, why not? So they flew me to New York. 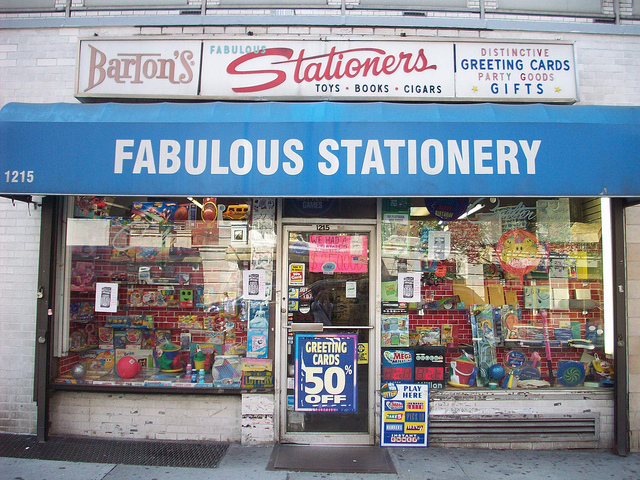 While I was there last time, I visited a shop called Barton’s which sold fabulous stationery. I mention it in my book. I bought an out-of-date date stamp from there. Barton’s Fabulous Stationers. 1215. I didn’t know which street it was on, but the name and number were enough for me to be able to look it up online and find the address. I looked it up on Google Street View and was a bit confused and a bit concerned. Was this the right place? It didn’t really look the same, but there was a bus in the way. I couldn’t see the Barton’s sign, but they sold toys and things, so I thought maybe the Halloween sign had been put up temporarily to promote a display of masks and costumes they might have had in the store. I went to have a look for myself. My hope that the Halloween sign was just a temporary thing intended to promote a modest display of masks was perhaps a little naive. This was a shop dedicated to dressing up. This was not Barton’s Fabulous Stationers. Had I gone to the wrong place? I went back outside. I looked at the picture of Barton’s on my phone. The whole thing looked completely different. Barton’s had a door in the middle, this place had a door on the side. I wondered if maybe I’d gone to the wrong address. But then I noticed it. That air vent, the manhole cover and that grille. They were the same. It was the same place. Barton’s is no more. New York is dead to me. I’m so sorry, James, about that 2nd Ave. store, being no more; but I’m glad you saved me a stationery-less trip. Sadly, real estate prices are so high in Manhattan that closures are very common. James Ward, I find your blog interesting, I too love all things boring. I feel people don’t appreciate the littler things in life. I’m also very jealous of your name, it’s just normal. I used to have a relatively normal name before I got married. Then I took on a interesting name, everyone mentions it. I even considered keeping my old name…but that would have been even more interesting than taking on my husbands name. So I’m stuck with my interesting..non boring surname. Keep up the great work on behalf of the rest of us who enjoy the mundane things in life!